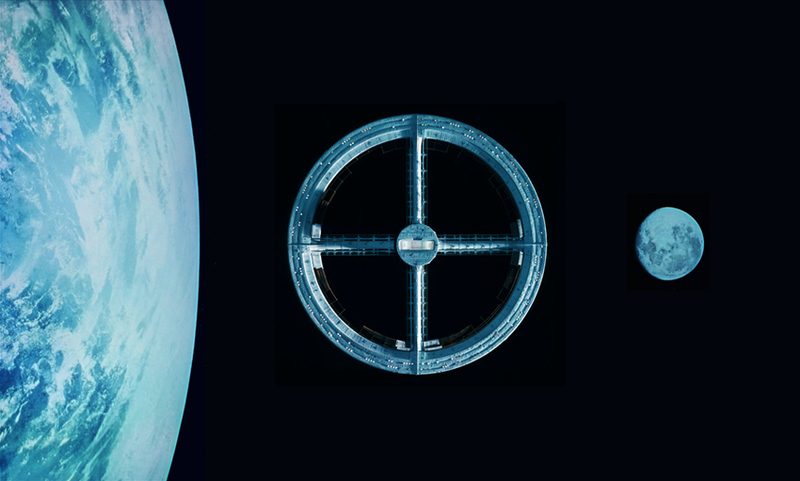 A thread devoted to the most gorgeous and iconic space station ever ! Share your thoughts, info and pictures and see what we can learn about it. Yep, that famous space station! Lot's of people (including on the RPF) have tried to build that monster of a model (fairly big if you see the sad picture of that model in a field, somewhere in England ). You have to be mad to start on that scale...maybe someday I'll tackle it. 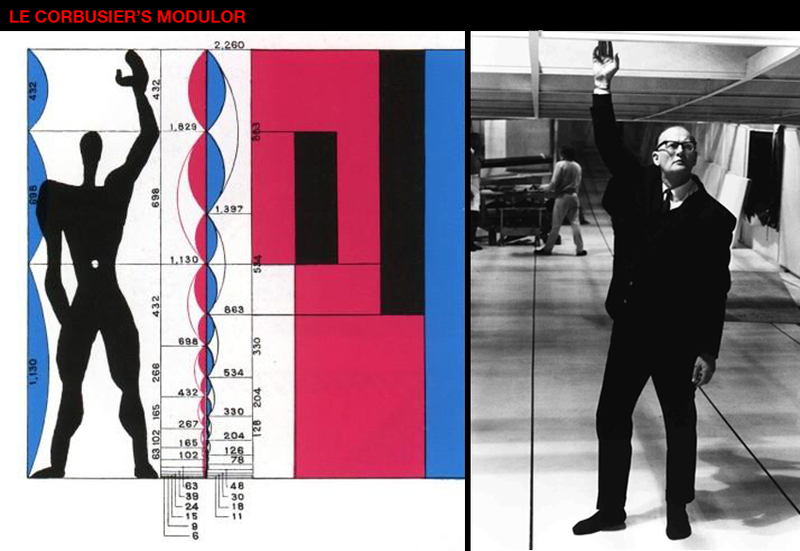 Some weeks ago I stumbled on a few behind the scenes photos taken on the Station V sets, and one particular photo of Arthur C. Clarke (pic below) caught my eye because it reminded me of Le Corbusier's Modulor drawing. It was developed as a visual bridge between two incompatible scales, the Imperial system and the Metric system. It is based on the height of an English man with his arm raised. It's then possible to imagine that the Modulor would have been the main anthropometric scale of proportions used in space architecture, according to Kubrick and his Art department ! It is based on the height of an English man with his arm raised. It is an easy pose to have happen by accident, but the resemblance is eerie. It looks like he might have also used some golden section mathematics too. It looks like he might have also used some golden section mathematics too. The guy on the left in the back certainly looks like he is wearing his socks too. The guy on the right may have booties on or just have big feet. No way they would have been wearing anything that would scuff those floors...Too much work to buff out. I am also willing to bet that Arthur is reaching up because he is in a spot that is not level anymore as the floor curves up. It is a natural instinct to reach out to hold onto something when the floor is uneven. If you have ever been in one of those fun houses with the slanted floor, you will know what I am talking about. One thing is for sure, the shoulder pads he is wearing certainly make him look that much more like the Corbusier drawing. Sorry Andy but I double-checked and I can certify now that both wear shoes. To me the outline of them does not look so much like a shoe, but more like a slipper. They look thin and don't add too much volume around the foot, and even seem a little "curvy", rather than stiff like a shoe. That is just what it looks like to me though. To me they definitely look like shoes. I had some thoughts about it and I don't think it would be accepted by carpenters (and I don't even talk about their syndicate) to work only in socks or even in sleepers (you need to protect your toes when you build an architecture). Note : These photos come from Doug Trumbull's excellent site. I withdraw my theory completely Fred. You are 100% correct as far them wearing shoes on set. I went looking for other behind the scenes shots too, and could't find them except for actors on set, so you beat me to it. I was also remembering the stories on set for BR where no one was allowed to wear shoes on the Tyrell office set after it was built. They had a terrible time protecting the shiney finish, especially when Ridley decided to flip the columns around. They had to cover it with tarp. Then Paul M Sammon walked on set without the protective booties on and scuffed it up, and they needed to repolish it. Arthur is still alive as far as I remember. I wonder if we could ask him? He used to be willing to converse with fans when I was in high school, but I am not sure how his health is any more, or memory for that matter. Arthur is still alive as far as I remember. If he answers this one you'll be the first to know here ! I do spy the Poloroid photographer in the middle of the one photo definately wearing socks. The B&W pic at the left shows clearly a few things: main actors re-hearsing + shoes. Women at the left: protective slippers. Stanley in the middle (either taking pics or viewing the scene: slippers. I know this is the blind men looking at the elephant, but I think they all have shoes on. If Stanley had slippers on, they ALL would have slippers on …. The woman is wearing a type of shoe that was popular in the 60's. I am willing to bet that the actor's shoes though would have had had felt added to the bottom of them. 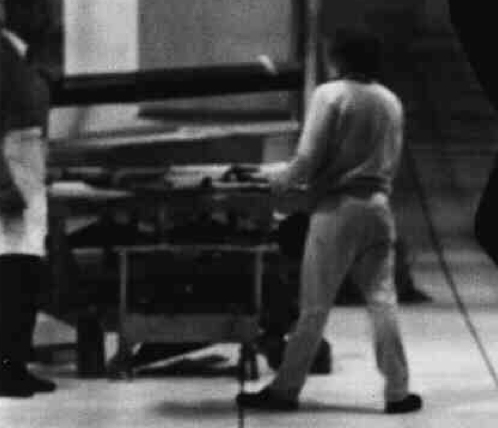 I can see the workers wearing there shoes until they had to clean the floor just before filming. Then it may have been socks and protected shoes only, and since Stanley didn't have his shoes felted, it was socks for him and the press photographer. Black scuffs on that floor would have been disasterous, and a huge delay in timing to have to clean up over and over as the shooting went on. I have to stick to my guns in believing they needed to do something to keep that floor clean once shooting started. I agree 100% with you BW ! The Repettos even connect Gainsbourg in a certain way with Kubrick and 2001... 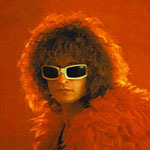 Listen to this : The couple he formed with Jane Birkin was the most glamourous in the late 60's / early 70's France. Now, guess who is Jane Birkin's brother ? Andrew Birkin, one of Stanley Kubrick's assistants on 2001. He took all the landscape photos that were used in "The Dawn of Man" sequence !